For shipboard guests William J. Nolan and Catherine Nold, Friday, March 11, 2016 was hardly a typical day. Catherine is Director, Communications and Marketing, for American Baptist International Ministries, headquartered in Valley Forge, PA. (She has visited myriad countries overseas.) Bill is the recently retired executive director for KenCrest, a Lutheran Services in America organization, supporting children and adults with intellectual disability. For Bill, the visit brought to life fond memories of his father, who served as a merchant mariner aboard the ships of an English fleet. On March 11, the two visited Waste Management Terminal in Tullytown, boarded the cargo ship named Team Progress. The ship is flagged in the Marshall Islands and was in our area to receive several holds worth of scrap metal destined for a recycling plant in Turkey. Instead of office ceiling light fixtures above, they could watch (and avoid being beneath) a crane with a huge, jaw-like shovel loading scrap onto the ship. Instead of walking on office carpeting, they maneuvered over a complex bed of metal shards and items like stroller wheels that had fallen from the shovel’s overflow onto the dockside surface next to the ship. Instead of taking the elevator or a flight of traditional stairs with railings to reach their offices, they donned work gloves to climb a long, steep gangway with grimey rope railings in order to reach the Team Progress’s main deck. 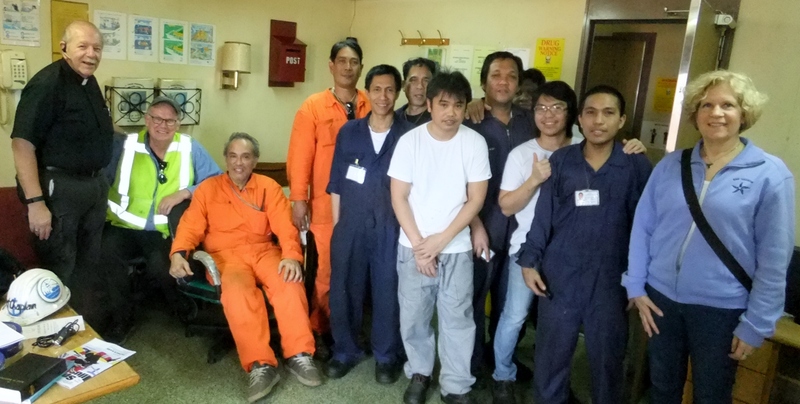 Once aboard the ship, the guests were eagerly greeted by a 22-member Filipino crew, grateful for their visit. The guests were accompanied by the Rev. 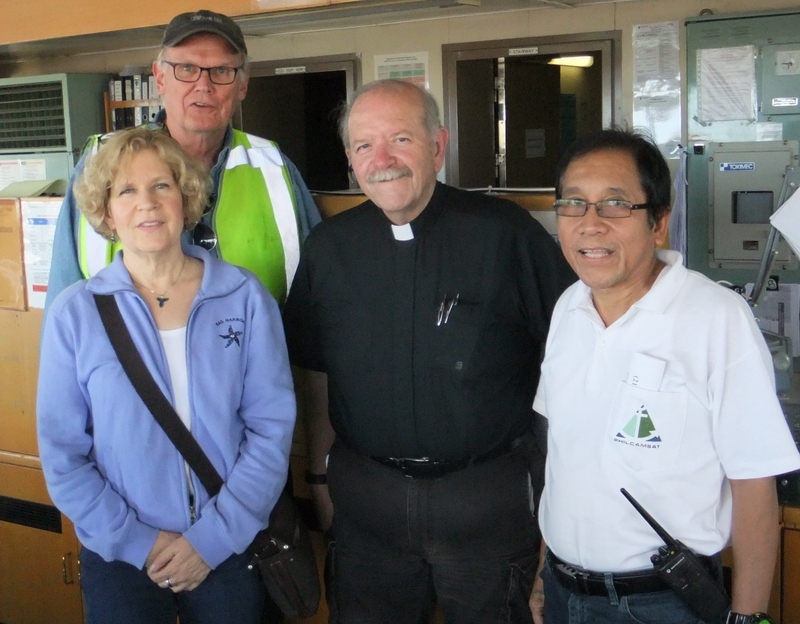 William Rex, a Lutheran Chaplain on call from Seafarers International House in New York City to serve with Seamen’s Church Institute of Philadelphia and South Jersey (SCI), and volunteer ship visitor Mark Staples. Rex was armed with wifi “hotspots” and phone top off cards so that the grateful crew could be in touch with their families back home while in Philadelphia. He also brought tins of cookies and magazines for the crew to enjoy. Only two of the crewmembers had visas qualifying them for trips ashore during their stay. Catherine and Bill chatted with the ship’s Fourth Engineer, Efrendie Cestona, who gleefully shared photographs on his computer with them. As Cestona displayed images of his wife, children and extended family, his eyes lit up and his face broke into a broad smile. “I have not been home for 11 months, but I know I am going to be granted leave to see them again very soon,” Cestona said of his family members. Many crew members serve long months at a time between home visits. Captain Frederico Melendres told the visitors that he had come up through the ranks of maritime service, qualifying to become a Captain seven years ago. He’s been to Argentina and Iceland, Alaska and Venezuela, just to name a few ports. He’s had oversight of all kinds of cargo, including salt and soybeans. Challenging weather on the high seas, he said, is always the biggest difficulty aboard ships he has governed. “Being a captain is a lot of responsibility,” he explained. The captain proved to be an exceptionally gracious host. He took his guests up to the bridge, then through the impressively clean engine room for a complete tour of the vessel. “This visit was really an ‘immersion’ experience for me,” Catherine Nold said. She had just returned from an immersion visit of a different kind to Mexico. Nolan reminded us to, “ask questions when you can,” and reflected on new leanings about his late father’s life on board a similar vessel.